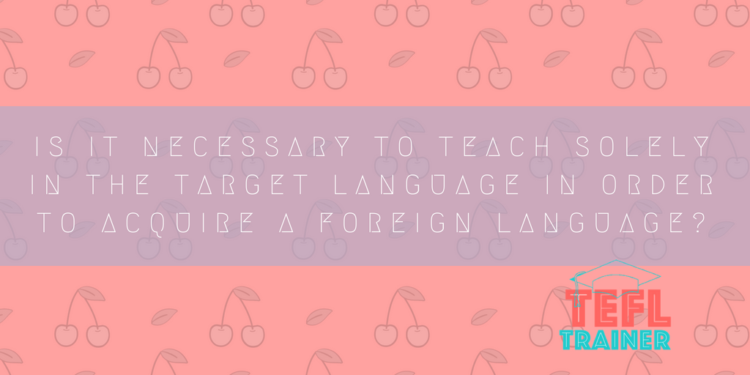 Is it necessary to teach solely in the target language in order to acquire a foreign language? Didactics, Pedagogy and Learning Difficulties. In order to acquire a foreign language, many people are of the opinion that it should taught through a medium of monolingualism and a pivotal piece of research called the ‘Immersion Programme’ (Swain and Lapkin, 1982) that was undertaken in Canada demonstrates how this method may be effective. This scheme incorporated 250,000 English speaking primary school children to learn French through three different methods; ‘Early Total Immersion’ (all classes in French), ‘Early Partial Immersion’ (all classes in French and English) and ‘Late Immersion’ (all classes in English with French as a solitary subject). The aim of this scheme was to discover the most effective method of second language acquisition. The result from the investigation was clear: “[…] they [the students] are far superior on all four skills to English speakers who only follow French-as-a-subject.” (Khoo, Kreher and Wong, 1994). This depicts that the lessons taught solely in the target language made the students better at listening, speaking, reading and writing skills overall in comparison to the late immersion scheme students, which indicates that being taught solely in the target language is more effective. On the other hand, according to ‘The Study of Second Language Acquisition’ from Ellis (1994), it is extremely useful to include a native language because there is no form of consolidation or link in the brain for memory clusters if a language is solely being taught in the target language. In addition to this, support is shown through the quotation from Turnball and Arnett (2002) where they state that “[…] mere exposure to the target language does not entirely guarantee that it becomes internalized as intake […]”. Therefore, one can say that the use of the native language is advocated and suggests that it should be utilised in a balance with the target language in order to create a link between the two languages, thus enabling a more accurate interpretation. Incorporating the aforementioned points of view in relation to my own experience of TEFL, I feel that students who are of a basic to pre-intermediate level develop slower when there is a monolingual approach and they need a mixture to avoid misinterpretation and key basic elements such as metalanguage. However, people of a higher level are more capable of retaining structure due to the fact that they already have extensive knowledge of metalanguage and how things may be explained. This is not to say that they still should not use their native language. I have discovered that using the logic of their own language to acquire the L2 (even at an advanced level) is a useful method so that students can form the connection. An example of this would be a student I had, who, at first, struggled with the monolingual approach of English. Within lesson reports, teachers often wrote that the level was too high or that the student had difficulty understanding some rules or with general comprehension. Subsequently, I decided to introduce more of the L1 into classes and to add an approach that was adapted to suit a visual learner, which resulted in improved comprehension and retention over the next classes. There are obviously many variables that can affect the acquisition of language such as age, level and aptitude – not to mention learner types. What is important, through my experience (especially with new students), is to cover all bases with learning types such as a combination of aural and spatial techniques so that students have a variety of methods to acquire from. Moreover, one must realise that students are not ‘mummied’ from birth in the context of how a native would acquire the MT. All in all, I have come to the conclusion that both methods of language teaching work in their own unique way. After having experienced both aspects of teaching, I believe that there should be an even balance between the use of the target and native languages. The native language should be used as a form of consolidation and creating links between the TL and the L1. A further aspect that I believe could impact the use of the target language is the aptitude of the students. If they are weaker, I am of the sure opinion that they would theoretically need a higher usage of the native language in order to comprehend what is being taught. Khoo, R., Kreher, U. and Wong, R. (1994). Towards Global Multilingualism. Clevedon: Multilingual Matters. Turnbull, M. and Arnett, K. (2002). 11. TEACHERS’ USES OF THE TARGET AND FIRST LANGUAGES IN SECOND AND FOREIGN LANGUAGE CLASSROOMS. APL, 22.